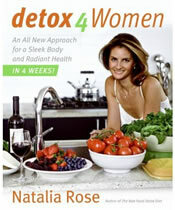 Detox for Women was created by Natalia Rose, a clinical nutritionist, who is best known as the author of the Raw Food Detox Diet. She claims that her program will allow women to achieve a sleek body and radiant health in just four weeks. Rose states that modern women have ‘a system that has been seriously compromised by lifestyle’. This has disrupted their microbial balance to the degree that a specific dietary approach for detox is necessary. She says that her plan has been uniquely formulated to address the needs of women and is different from other approaches that are popular in the raw foods and detox movement. The basic concept of the plan is to normalize yeast and bacterial imbalances by increasing the intake of alkalizing foods. Many foods that are common in other raw food and detox diets such as fruit, sprouted grain bread, nuts and honey must be limited because of their potential to exacerbate a yeast problem. Achieved by a Candida albicans diet that reduces the amount of starches and sugars in the diet, avoiding foods that are hard to digest (such as grains, nuts and dairy), practicing food combining and avoiding excessive snacking. In order to make it easy to stick with the program you need to make a plan. You will take into account things including shopping, food preparation, ensuring you have the right foods available at work etc. Involves creating a daily routine that will be easy for you to follow as a lifestyle. There are two options with the main program: one that is more intensive and another that includes a greater degree of flexibility. With both options women are allowed the occasional treat such as wine or dark chocolate if desired. Rose advises dieters to increase their intake of raw foods including certain fruits, raw vegetables and fresh juices. However her plan also allows for the incorporation of high quality cooked foods and animal products. Rose says that some foods that are included in the plan, such as fish and goat cheese, may not be pure foods. However this is okay and actually necessary because in today’s world we need these foods in order to cleanse intelligently. These foods can prevent a rapid cleansing that may be the cause of uncomfortable detox symptoms. She says that including cooked foods in the diet slows down the cleanse to the perfect degree to allow maximum waste elimination without reabsorption of toxins. Raw vegetables, fresh juices, cooked low starch vegetables, stevia, berries, granny smith apples, grapefruit, avocado, raw goat cheese, organic eggs, dark chocolate, millet, quinoa, buckwheat, Dijon mustard, sea vegetables, raw soy sauce, herb tea. Dieters are encouraged to do some exercise every morning upon awakening. Yoga, dance, and rebounding are recommended. Detox for Women retails at $25.99. May assist with elimination of Candida. The author is very encouraging and supportive. Includes 30 days of meal plans with recipes. Offers advice for coping with emotional factors that may influence eating behaviors. Allows for some treats including wine and chocolate. Dieters have a choice of a strict or more flexible option. Includes cooked food and animal products, which reduces the likelihood of nutritional deficiencies that are common on other raw food and detox diets. Fairly strict program that eliminates a wide variety of common foods. May be difficult for some dieters to understand and incorporate the guidelines for food combining. Some dieters may not easily adjust to having only vegetable juice for breakfast. Will require more time to be spent on food preparation. Detox for Women allows dieters to experience the benefits of a raw food and detox diet without the need to undertake an extreme approach. While it is still fairly strict and will not appeal to everyone, it will most likely produce improvements in health, vitality, and weight loss for those who adhere to the program. I dropped 30 pounds in a few months by going vegan. I don’t eat meat, egg, or dairy products. That means preparing your own food. Eating whole fresh fruits and vegetables. Water is a natural detoxifier but you don’t have to just drink water. Actually, eating raw fruits will carry water into your colon and cause a cleansing. Try it. Is skimmed milk allowed in this diet.. i’m new to it so i could really use your help..
what if you do not like salmon, can you use something else,I need to drop at least 25 pounds, I have a throyd problem it has caused me to gain weight and I am not happy at all, can you please help me with this. this sample diet worked out……………..i m so happy with my slim body..